The author sits with trepidation, sets her lukewarm coffee on the desk beside her, and stares at the screen. The task before her seems monumental. Unthinkable. And yet she knows it is up to her. She has started this thing, she has moved mountains to get to this point, but now it is up to her to complete the final pages. Her fingers hover, unsure. They tap a few words, stop, then try again. Daunted, the author reaches for her coffee and leans back in her swivel chair, determined to force the muses to the front of her mind. “Speak to me. Tell me what to say,” she pleads, but the air in her mind is silent. No one can help her this time. It is a task she must complete alone. A guest blog. Not necessarily such a baffling assignment, but the road has been long. She’s written nearly fifty guest blogs this month alone and had thought she was done. She’d settled back into her day to day work: writing, editing, teaching piano … When she checked her calendar her heart skipped, and not in a pleasant way. Had she written that blog? She couldn’t recall. A frantic search through her files revealed nothing. She sucked in her pride and emailed the blogger. “Do I owe you a blog?” she typed. The blogger wrote back something along the lines of, “That would be great!” and she knew. It had to be done. Her mind kept coming up blank. Should she discuss Historical Romance versus Historical Fiction? No. Though it’s a topic for which she has a passion, she’d written that too many times. Perhaps touch on historical truths uncovered during research? No. That had also been done. Searching the reviewer’s blog for ideas on earlier author postings offered no inspiration. She had tried to put something together the night before, but had given up, drawn instead to the warmth and comfort of her extremely patient husband. About five years ago, she had started writing. Before then she had been completely immersed in lush, epic historical adventures, having read the genius works of Sara Donati, Jennifer Roberson, Penelope Williamson, Wilbur Smith, and others. Her ultimate inspiration had been the incredible work of Diana Gabaldon, who would forever occupy the role of “idol” in her heart. Through their books the author had been swept up in the genre, taken prisoner, prodded at swordpoint until at last she relented and attempted her own fledgling novel. At first she feared her work might too closely resemble the writing of one of her favourite authors, so she stopped and backtracked, giving her mind room to colour the phrases and characters with her own interpretations. It became soothing, after a while, feeling the words and ideas flow. Therapeutic, actually. After eight months of writing and researching, her first book emerged at a whopping 150,000 words, but over the next three years she learned about editing, about making a book into something people will love. When she was finally signed by a well-respected literary agent, “Under the Same Sky” contained less than 90,000 words, but every one of them had value. The first publisher to see it, Penguin, purchased not only her first novel, but requested a second, which is how “Sound of the Heart” came to be. Practically giddy with excitement, she plunged back into the process, injecting her own “voice”, her own sense of prose, filling the pages with stories no one had ever written before. She was thrilled when reviews started coming out, because—truth be known—she had been terrified no one would want to read her writing. News spread about this new author, her unique voice, and the unexpected books which captured readers’ hearts. Reviewers started calling her a “must-read” author. The author was blown away by the reaction. She was writing her own stories, saying things the way she saw them. She had initially been influenced by other authors, but no longer relied on their guidance. She was flying on her own and wanted to whoop with joy when yet another person asked her to sign their book. Ironically, then, it was three separate compliments which almost moved her to happy tears. She had been working so hard to stand on her own, to create something from her own mind, and the three compliments which meant the most were all based on the writing of another author: her idol, her inspiration for writing in the first place. The first two were from well-respected book reviewers, who compared the author’s hero in her second novel, Dougal MacDonnell, to Jamie Fraser, the hero in Diana Gabaldon’s incredible “Outlander” series. Both suggested Dougal was in the running for their #1 Favourite Scottish Hero position. The author was amazed, though in her own heart she too had fallen in love with Dougal long before. She couldn’t blame the reviewers for doing the same. It was at one book signing where she received what she felt was her ultimate compliment. The woman standing in front of her at the signing had said she had been waiting patiently for the second book after having completed “Under the Same Sky”. She asked the author if she’d mind being compared to another author, because she could only think of one other author who had so completely swallowed her up in a story. “Of course not,” the author replied, curious. She was always looking for new authors to read—had already been compared by Joanna Bourne to the grand master, John Jakes, whose books she had yet to read—and was just about to write down the name when the woman spoke again. It would have been unseemly for the author to burst into tears at this point, in the middle of a bookstore, surrounded by potential readers. But in her heart she rejoiced. Her stories had been put in the same circle as those of her idol. She had been quietly placed on the same shelf as that great author, side by side on the “G” shelf. But she had retained her own voice, her own individual style of writing. She doubted there could be any finer compliment than that. I really enjoyed this book. I have a lot of interest in Scottish history because of William Wallace and Rob Roy so any chance I get to read a book with Scottish characters and set in Scotland is wonderful. 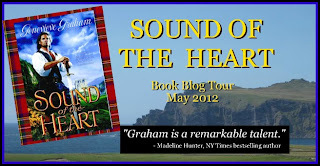 Set in 18th century Scotland, with settings in England and the American colonies as well, Sound of the Heart is an exciting historical tale with two extraordinary characters, Dougal and Glenna. I'm not usually big on romance in novels, but the relationship between the two main characters is so sweet and genuine, I couldn't help but enjoy reading about their times together. Graham has taken one of the difficult periods in Scottish history, the time of the Jacobite rebellion, and turned it into a story of personal triumph and love. She has written the dialogue in Scottish brogue, which I thoroughly enjoyed. I likened myself to a Scottish lassie as I experienced the Scottish intonations in my head. 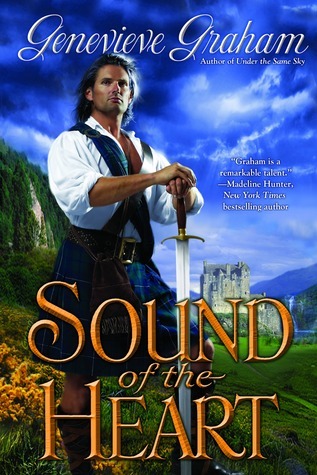 I highly recommend Sound of the Heart to anyone who enjoys Scottish history with a bit of romance added to the mix. Now I must check out Graham's first novel, Under the Same Sky. She is a talent I will not soon forget. Dougal MacDonnell, a fierce warrior from the Highlands of Scotland, is able to hear the thoughts of other men and dream how the future will unfold. Devastated by the loss of his family during the Battle of Culloden in 1746, he fosters a deep hatred for the English. But when Glenna, the love of his life and a Scottish outlaw, is captured and shipped overseas, Dougal is forced to join an English army made of vanquished Scots. Now fighting on the side of his sworn enemies, he embarks on a journey that will take him across the seas to the colonies. There he will risk everything for the chance to find his true love. Enter in the Rafflecopter below. The contest runs May 1-31/12 and is only open to entrants in Canada & U.S.). If you are going to be compared to any author then Diana Gabaldon is definitely a great one for that to be! Marg, I just about passed out when she said that. What a dream! Actually, I'd never even dreamed that high!